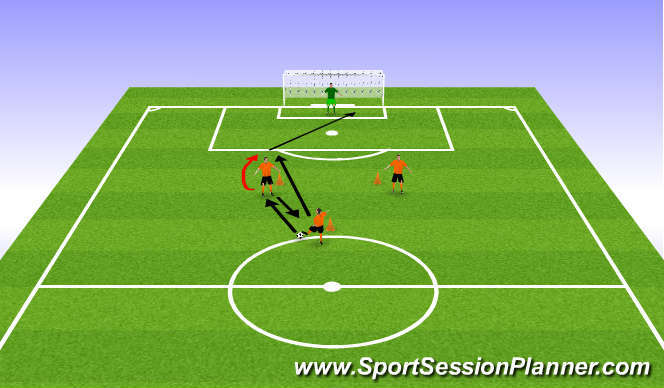 Attacking Specific Drill - Area set up as shown. Small Group work with attackers only. 1. Feeder serves ball into first striker, who sets ball back and spins to receive pass in front of him. Attacker to shoot at goal within two touches max. 2nd attacker follows in for rebounds. 2. Feeder serves ball in, attacker on receiving &apos;drops a shoulder&apos; and turns, keeping his body in between the cone/marker and the ball. Attacker shoots at goal. 3. Feeder serves ball in, attacker sets ball back, then attacker 1 and 2 switch positions - feeder slides ball into either attacker for shot at goal within 2 touches.